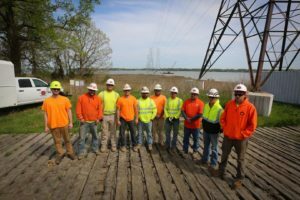 Line Workers Factor in Lunar Tides to Complete the Nansemond River Crossing Project for Dominion Energy - The L.E. 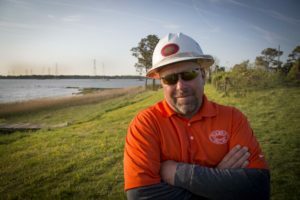 Myers Co.
SUFFOLK, Virginia – If part of your commute involves donning a life vest, chances are the job you’re heading to isn’t a simple one. The L.E. Myers Co. (L.E. 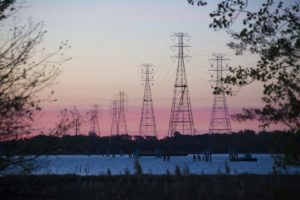 Myers) line workers who successfully completed the Nansemond River crossing project in Suffolk, Virginia for Dominion Energy can certainly attest to that. 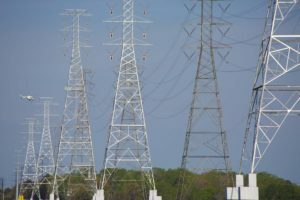 The scope of work included replacing the existing 1.3-mile section of transmission line spanning the Nansemond, a tributary of the James River, with five new 230kV double circuit lattice structures and two new 230kV double-circuit monopole structures. 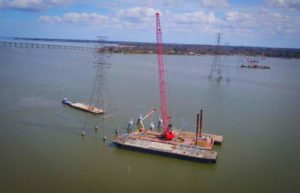 The concrete and steel foundations, built by marine contractor W.F Magann Corporation, were designed to reduce saltwater exposure and withstand storm surges. 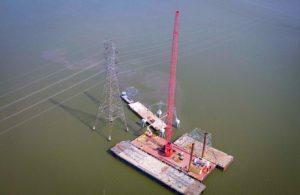 Sections of lattice towers were assembled on land by line crews, floated by barge out to the site and lifted into place by a 450-ton crane. 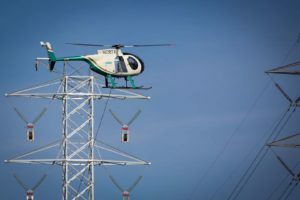 An air crane was used to fly in the top portion of the highest structure, measuring 250-feet-tall. 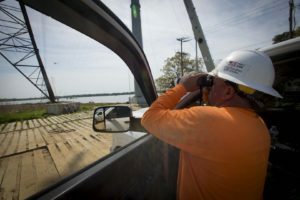 Building over water has its own unique set of challenges, from scheduling work around the tides to controlling boat traffic below when helicopters are flying overhead. Established in 1891, L.E. 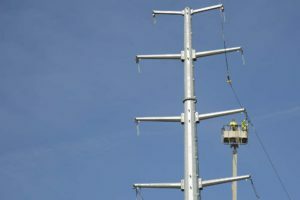 Myers, the oldest MYR Group subsidiary, is recognized as one of the nation’s premier specialty electrical contractors in the industry and has significant experience with these types of projects. The L.E. 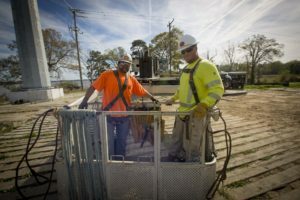 Myers construction team’s ability to forge a strong bond with W.F. 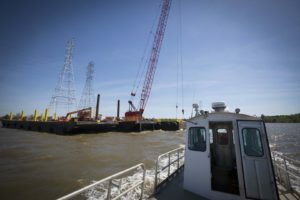 Magann Corporation, the folks who built the foundations and brought the barges, boats and cranes, was key.